The Palais Garnier (pronounced [palɛ ɡaʁnje] French (help·info)) is a 1,979-seat opera house, which was built from 1861 to 1875 for the Paris Opera. It was called the Salle des Capucines, because of its location on the Boulevard des Capucines in the 9th arrondissement of Paris, but soon became known as the Palais Garnier, in recognition of its opulence and its architect, Charles Garnier. The theatre is also often referred to as the Opéra Garnier (pronounced [ɔpeʁa ɡaʁnje] French (help·info)) and historically was known as the Opéra de Paris or simply the Opéra, as it was the primary home of the Paris Opera and its associated Paris Opera Ballet until 1989, when the Opéra Bastille opened at the Place de la Bastille. The Paris Opera now uses the Palais Garnier mainly for ballet. The Palais Garnier has been called "probably the most famous opera house in the world, a symbol of Paris like Notre Dame Cathedral, the Louvre, or the Sacré Coeur Basilica." This is at least partly due to its use as the setting for Gaston Leroux's 1910 novel The Phantom of the Opera and, especially, the novel's subsequent adaptations in films and the popular 1986 musical. Another contributing factor is that among the buildings constructed in Paris during the Second Empire, besides being the most expensive, it has been described as the only one that is "unquestionably a masterpiece of the first rank." This opinion is far from unanimous however: the 20th-century French architect Le Corbusier once described it as "a lying art" and contended that the "Garnier movement is a décor of the grave". The Palais Garnier also houses the Bibliothèque-Musée de l'Opéra de Paris (Paris Opera Library-Museum), although the Library-Museum is no longer managed by the Opera and is part of the Bibliothèque Nationale de France. The museum is included in unaccompanied tours of the Palais Garnier. The opera was constructed in what Charles Garnier (1825-1898) is said to have told the Empress Eugenie was "Napoleon III" style The Napoleon III style was highly eclectic, and borrowed from many historical sources; the opera house included elements from the Baroque, the classicism of Palladio, and Renaissance architecture blended together. These were combined with axial symmetry and modern techniques and materials, including the use of an iron framework, which had been pioneered in other Napoleon III buildings, including the Bibliotheque Nationale and the markets of Les Halles. The façade and the interior followed the Napoleon III style principle of leaving no space without decoration. 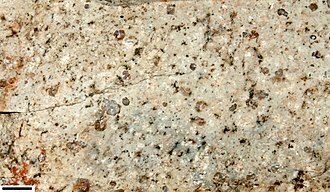 Garnier used polychromy, or a variety of colors, for theatrical effect, achieved different varieties of marble and stone, porphyry, and gilded bronze. The façade of the Opera used seventeen different kinds of material, arranged in very elaborate multicolored marble friezes, columns, and lavish statuary, many of which portray deities of Greek mythology. The principal façade is on the south side of the building, overlooking the Place de l'Opéra and terminates the perspective along the Avenue de l'Opéra. Fourteen painters, mosaicists and seventy-three sculptors participated in the creation of its ornamentation. The two gilded figural groups, Charles Gumery's L'Harmonie (Harmony) and La Poésie (Poetry), crown the apexes of the principal façade's left and right avant-corps. They are both made of gilt copper electrotype. The bases of the two avant-corps are decorated (from left to right) with four major multi-figure groups sculpted by François Jouffroy (Poetry, also known as Harmony), Jean-Baptiste Claude Eugène Guillaume (Instrumental Music), Jean-Baptiste Carpeaux (The Dance, criticised for indecency), and Jean-Joseph Perraud (Lyrical Drama). The façade also incorporates other work by Gumery, Alexandre Falguière, and others. Gilded galvanoplastic bronze busts of many of the great composers are located between the columns of the theatre's front façade and depict, from left to right, Rossini, Auber, Beethoven, Mozart, Spontini, Meyerbeer, and Halévy. On the left and right lateral returns of the front façade are busts of the librettists Eugène Scribe and Philippe Quinault, respectively. The sculptural group Apollo, Poetry, and Music, located at the apex of the south gable of the stage flytower, is the work of Aimé Millet, and the two smaller bronze Pegasus figures at either end of the south gable are by Eugène-Louis Lequesne. Also known as the Rotonde de l'Empereur, this group of rooms is located on the left (west) side of the building and was designed to allow secure and direct access by the Emperor via a double ramp to the building. When the Empire fell, work stopped, leaving unfinished dressed stonework. It now houses the Bibliothèque-Musée de l'Opéra de Paris (Paris Opera Library-Museum) which is home to nearly 600,000 documents including 100,000 books, 1,680 periodicals, 10,000 programs, letters, 100,000 photographs, sketches of costumes and sets, posters and historical administrative records. Located on the right (east) side of the building as a counterpart to the Pavillon de l'Empereur, this pavilion was designed to allow subscribers (abonnés) direct access from their carriages to the interior of the building. 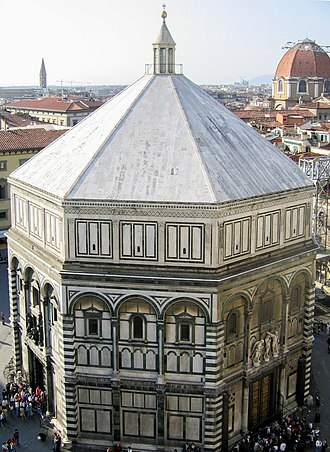 It is covered by a 13.5-metre (44-ft) diameter dome. Paired obelisks mark the entrances to the rotunda on the north and the south. The interior consists of interweaving corridors, stairwells, alcoves and landings, allowing the movement of large numbers of people and space for socialising during intermission. Rich with velvet, gold leaf, and cherubim and nymphs, the interior is characteristic of Baroque sumptuousness. The building features a large ceremonial staircase of white marble with a balustrade of red and green marble, which divides into two divergent flights of stairs that lead to the Grand Foyer. Its design was inspired by Victor Louis's grand staircase for the Théâtre de Bordeaux. The pedestals of the staircase are decorated with female torchères, created by Albert-Ernest Carrier-Belleuse. The ceiling above the staircase was painted by Isidore Pils to depict The Triumph of Apollo, The Enchantment of Music Deploying its Charms, Minerva Fighting Brutality Watched by the Gods of Olympus, and The City of Paris Receiving the Plan of the New Opéra. When the paintings were first fixed in place two months before the opening of the building, it was obvious to Garnier that they were too dark for the space. With the help of two of his students, Pils had to rework the canvases while they were in place overhead on the ceiling and, at the age of 61, he fell ill. His students had to finish the work, which was completed the day before the opening and the scaffolding was removed. This hall, 18 metres (59 ft) high, 154 metres (505 ft) long and 13 metres (43 ft) wide, was designed to act as a drawing room for Paris society. It was restored in 2004. Its ceiling was painted by Paul-Jacques-Aimé Baudry and represents various moments in the history of music. The foyer opens onto an outside loggia and is flanked by two octagonal salons with ceilings painted by Jules-Élie Delaunay in the eastern salon and Félix-Joseph Barrias in the western salon. The octagonal salons open to the north into the Salon de la Lune at the western end of the Avant-Foyer and the Salon du Soleil at its eastern end. Part of the ceiling of the Grand Foyer with paintings by Paul Baudry: the central rectangular panel is Music, while the oval panel at the western end is Comedy. The auditorium has a traditional Italian horseshoe shape and can seat 1,979. The stage is the largest in Europe and can accommodate as many as 450 artists. The canvas house curtain was painted to represent a draped curtain, complete with tassels and braid. The ceiling area which surrounds the chandelier was originally painted by Jules Eugène Lenepveu. In 1964 a new ceiling painted by Marc Chagall was installed on a removable frame over the original. It depicts scenes from operas by 14 composers – Mussorgsky, Mozart, Wagner, Berlioz, Rameau, Debussy, Ravel, Stravinsky, Tchaikovsky, Adam, Bizet, Verdi, Beethoven, and Gluck. Although praised by some, others feel Chagall's work creates "a false note in Garnier's carefully orchestrated interior." The seven-ton bronze and crystal chandelier was designed by Garnier. Jules Corboz prepared the model, and it was cast and chased by Lacarière, Delatour & Cie. The total cost came to 30,000 gold francs. The use of a central chandelier aroused controversy, and it was criticised for obstructing views of the stage by patrons in the fourth level boxes and views of the ceiling painted by Eugène Lenepveu. Garnier had anticipated these disadvantages but provided a lively defence in his 1871 book Le Théâtre: "What else could fill the theatre with such joyous life? Who else could offer the variety of forms that we have in the pattern of the flames, in these groups and tiers of points of light, these wild hues of gold flecked with bright spots, and these crystalline highlights?" On 20 May 1896, one of the chandelier's counterweights broke free and burst through the ceiling into the auditorium, killing a concierge. This incident inspired one of the more famous scenes in Gaston Leroux's classic 1910 gothic novel The Phantom of the Opera. Originally the chandelier was raised up through the ceiling into the cupola over the auditorium for cleaning, but now it is lowered. The space in the cupola was used in the 1960s for opera rehearsals, and in the 1980s was remodelled into two floors of dance rehearsal space. The lower floor consists of the Salle Nureïev (Nureyev) and the Salle Balanchine, and the upper floor, the Salle Petipa. 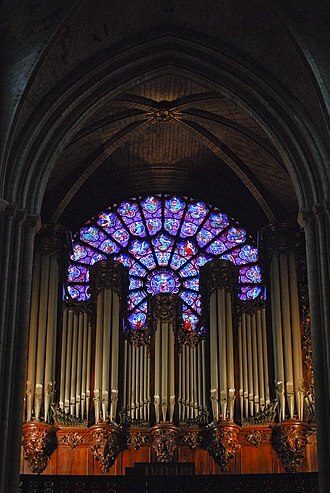 The grand organ was built by Aristide Cavaillé-Coll for use during lyrical works. It has been out of service for several decades. Garnier had originally planned to install a restaurant in the opera house; however, for budgetary reasons, it was not completed in the original design. On the third attempt to introduce it since 1875, a restaurant was opened on the eastern side of the building in 2011. L'Opéra Restaurant was designed by French architect Odile Decq. The chef was Christophe Aribert; in October 2015, Guillame Tison-Malthé became the new head chef. The restaurant, which has three different spaces and a large outside terrace, is accessible to the general public. In 1821 the Opéra de Paris had moved into the temporary building known as the Salle Le Peletier on the rue Le Peletier [fr]. Since then a new permanent building had been desired. Charles Rohault de Fleury, who was appointed the opera's official architect in 1846, undertook various studies in suitable sites and designs. By 1847, the Prefect of the Seine, Claude-Philibert de Rambuteau, had selected a site on the east side of the Place du Palais-Royal as part of an extension of the Rue de Rivoli. However, with the Revolution of 1848, Rambuteau was dismissed, and interest in the construction of a new opera house waned. The site was later used for the Grand Hôtel du Louvre (designed in part by Charles Rohault de Fleury). With the establishment of the Second Empire in 1852 and Georges-Eugène Haussmann's appointment as Prefect of the Seine in June 1853, interest in a new opera house revived. There was an attempted assassination of Emperor Napoleon III at the entrance to the Salle Le Peletier on 14 January 1858. The Salle Le Peletier's constricted street access highlighted the need for a separate, more secure entrance for the head of state. This concern and the inadequate facilities and temporary nature of the theatre gave added urgency to the building of a new state-funded opera house. By March, Haussmann settled on Rohault de Fleury's proposed site off the Boulevard des Capucines, although this decision was not announced publicly until 1860. A new building would help resolve the awkward convergence of streets at this location, and the site was economical in terms of the cost of land. On 29 September 1860 an Imperial Decree officially designated the site for the new Opéra, which would eventually occupy 12,000 square metres (1.2 ha; 130,000 sq ft). By November 1860 Rohault de Fleury had completed the design for what he thought would be the crowning work of his career and was also working on a commission from the city to design the façades of the other buildings lining the new square to ensure they were in harmony. However, that same month Achille Fould was replaced as Minister of State by Count Alexandre Colonna-Walewski. His wife Marie Anne de Ricci Poniatowska had used her position as mistress of Napoleon III to obtain her husband's appointment. Aware of competing designs and under pressure to give the commission to Viollet-le-Duc, who had the support of Empress Eugénie, Walewski escaped the need to make a decision by proposing to mount an architectural design competition to select the architect. On 30 December 1860 the Second Empire of Emperor Napoleon III officially announced an architectural design competition for the design of the new opera house. Applicants were given a month to submit entries. There were two phases to the competition. Charles Garnier's project was one of about 170 submitted in the first phase. Each of the entrants was required to submit a motto that summarised their design. Garnier's was the quote "Bramo assai, poco spero" ("Hope for much, expect little") from the Italian poet Torquato Tasso. Garnier's project was awarded the fifth-place prize, and he became one of seven finalists selected for the second phase. In addition to Garnier, among the others were his friend Leon Ginain, Alphonse-Nicolas Crépinet and Joseph-Louis Duc (who subsequently withdrew due to other commitments). To the surprise of many, both Viollet-le-Duc and Charles Rohault de Fleury missed out. The second phase required the contestants to revise their original projects and was more rigorous, with a 58-page program, written by the director of the Opéra, Alphonse Royer, which the contestants received on 18 April. The new submissions were sent to the jury in the middle of May, and on 29 May 1861 Garnier's project was selected for its "rare and superior qualities in the beautiful distribution of the plans, the monumental and characteristic aspect of the facades and sections". Garnier's wife Louise later wrote that the French architect Alphonse de Gisors, who was on the jury, had commented to them that Garnier's project was "remarkable in its simplicity, clarity, logic, grandeur, and because of the exterior dispositions which distinguish the plan in three distinct parts—the public spaces, auditorium, and stage ... 'you have greatly improved your project since the first competition; whereas Ginain [the first-place winner in the first phase] has ruined his.'" Legend has it that the Emperor's wife, the Empress Eugénie, who was likely irritated that her own favoured candidate, Viollet-le-Duc, had not been selected, asked the relatively unknown Garnier: "What is this? It's not a style; it's neither Louis Quatorze, nor Louis Quinze, nor Louis Seize!" "Why Ma'am, it's Napoléon Trois" replied Garnier "and you're complaining!" Andrew Ayers has written that Garnier's definition "remains undisputed, so much does the Palais Garnier seem emblematic of its time and of the Second Empire that created it. A giddy mixture of up-to-the-minute technology, rather prescriptive rationalism, exuberant eclecticism and astonishing opulence, Garnier's opera encapsulated the divergent tendencies and political and social ambitions of its era." Ayers goes on to say that the judges of the competition in particular admired Garnier's design for "the clarity of his plan, which was a brilliant example of the beaux-arts design methods in which both he and they were thoroughly versed." After the initial funds to begin construction were voted on 2 July 1861, Garnier established the Opéra Agence, his office on the construction site, and hired a team of architects and draftsmen. He selected as his second-in-command, Louis-Victor Louvet, followed by Jean Jourdain and Edmond Le Deschault. The site was excavated between 27 August and 31 December. On 13 January 1862 the first concrete foundations were poured, starting at the front and progressing sequentially toward the back, with the laying of the substructure masonry beginning as soon as each section of concrete was cast. The opera house needed a much deeper basement in the substage area than other building types, but the level of the groundwater was unexpectedly high. Wells were sunk in February 1862 and eight steam pumps installed in March, but despite operating continuously 24 hours a day, the site would not dry up. To deal with this problem Garnier designed a double foundation to protect the superstructure from moisture. It incorporated a water course and an enormous concrete cistern (cuve) which would both relieve the pressure of the external groundwater on the basement walls and serve as a reservoir in case of fire. A contract for its construction was signed on 20 June. Soon a persistent legend arose that the opera house was built over a subterranean lake, inspiring Gaston Leroux to incorporate the idea into his novel The Phantom of the Opera. On 21 July the cornerstone was laid at the southeast angle of the building's facade. In October the pumps were removed, the brick vault of the cuve was finished by 8 November, and the substructure was essentially complete by the end of the year. The emperor expressed an interest in seeing a model of the building, and a plaster scale model (2 cm per meter) was constructed by Louis Villeminot between April 1862 and April 1863 at a cost of more than 8,000 francs. After previewing it, the emperor requested several changes to the design of the building, the most important of which was the suppression of a balustraded terrace with corner groups at the top of the facade and its replacement with a massive attic story fronted by a continuous frieze surmounted by imperial quadrigae over the end bays. With the incorporated changes, the model was transported over specially installed rails to the Palais de l'Industrie for public display at the 1863 exhibition. Théophile Gautier wrote of the model (Le Moniteur Universel, 13 May 1863) that "the general arrangement becomes intelligible to all eyes and already acquires a sort of reality that better permits one to prejudge the final effect ... it attracts the crowd's curiosity; it is, in effect, the new Opéra seen through reversed opera glasses." The model is now lost, but it was photographed by J. B. Donas in 1863. The emperor's quadrigae were never added, although they can be seen in the model. Instead Charles-Alphonse Guméry's gilded bronze sculptural groups Harmony and Poetry were installed in 1869. The linear frieze seen in the model was also redesigned with alternating low- and high-relief decorative medallions bearing the gilded letters from the imperial monogram ("N" for Napoléon, "E" for Empereur). The custom-designed letters were not ready in time for the unveiling and were replaced with commercially available substitutes. After the fall of the empire in 1870, Garnier was relieved to be able to remove them from the medallions. Letters in Garnier's original design were finally installed during the restoration of the building in 2000. The scaffolding concealing the facade was removed on 15 August 1867 in time for the Paris Exposition of 1867. 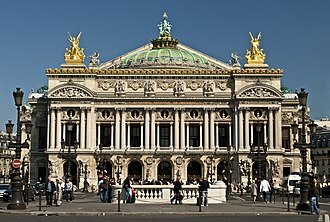 The official title of the Paris Opera was prominently displayed on the entablature of the giant Corinthian order of coupled columns fronting the main-floor loggia: "ACADEMIE IMPERIALE DE MUSIQUE". When the emperor was deposed on 4 September 1870 as a result of the disastrous Franco-Prussian War, the government was replaced by the Third Republic, and almost immediately, on 17 September 1870, the Opera was renamed Théâtre National de l'Opéra, a name it kept until 1939. In spite of this, when it came time to change the name on the new opera house, only the first six letters of the word IMPERIALE were replaced, giving the now famous "ACADEMIE NATIONALE DE MUSIQUE", an official title which had actually only been used during the approximately two-year period of the Second Republic which had preceded the Second Empire. All work on the building came to a halt during the Franco-Prussian War due to the siege of Paris (September 1870 – January 1871). Construction had so advanced that parts of the building could be used as a food warehouse and a hospital. After France's defeat Garnier became seriously ill from the deprivations of the siege and left Paris from March to June to recover on the Ligurian coast of Italy, while his assistant Louis Louvet remained behind during the turmoil of the Paris Commune which followed. Louvet wrote several letters to Garnier, which document events relating to the building. Because of the theatre's proximity to the fighting at the Place Vendôme, troops of the National Guard bivouacked there and were in charge of its defence and distributing food to soldiers and civilians. The Commune authorities planned to replace Garnier with another architect, but this unnamed man had not yet appeared when Republican troops ousted the National Guard and gained control over the building on 23 May. By the end of the month the Commune had been severely defeated. 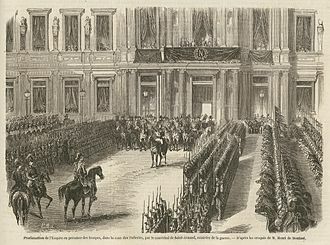 The Third Republic had become sufficiently well established by the fall, that on 30 September construction work recommenced, and by late October a small amount of funds were voted by the new legislature for further construction. The political leaders of the new government maintained an intense dislike of all things associated with the Second Empire, and many of them regarded the essentially apolitical Garnier as a holdover from that regime. This was especially true during the presidency of Adolphe Thiers who remained in office until May 1873, but also persisted under his successor Marshal MacMahon. Economies were demanded, and Garnier was forced to suppress the completion of sections of the building, in particular the Pavillon de l'Empereur (which later became the home of the Opera Library Museum). However, on 28–29 October an overwhelming incentive to complete the new theatre came when the Salle Le Peletier was destroyed by a fire which raged the entire night. Garnier was immediately instructed to complete the building as soon as possible. The cost of completion of the new house during 1874 was more than 7.5 million francs, a sum that greatly exceeded the amounts spent in any of the previous thirteen years. The cash-strapped government of the Third Republic resorted to borrowing 4.9 million gold francs at an interest rate of six percent from François Blanc, the wealthy financier who managed the Monte Carlo Casino. Subsequently (from 1876 to 1879) Garnier would oversee the design and construction of the Monte Carlo Casino concert hall, the Salle Garnier, which later became the home of the Opéra de Monte Carlo. During 1874 Garnier and his construction team worked feverishly to complete the new Paris opera house, and by 17 October the orchestra was able to conduct an acoustical test of the new auditorium, followed by another on 2 December which was attended by officials, guests, and members of the press. The Paris Opera Ballet danced on the stage on 12 December, and six days later the famous chandelier was lit for the first time. The theatre was formally inaugurated on 5 January 1875 with a lavish gala performance attended by Marshal MacMahon, the Lord Mayor of London and King Alfonso XII of Spain. The program included the overtures to Auber's La muette de Portici and Rossini's William Tell, the first two acts of Halévy's 1835 opera La Juive (with Gabrielle Krauss in the title role), along with "The Consecration of the Swords" from Meyerbeer's 1836 opera Les Huguenots and the 1866 ballet La source with music by Delibes and Minkus. As a soprano had fallen ill one act from Charles Gounod's Faust and one from Ambroise Thomas's Hamlet had to be omitted. During the intermission Garnier stepped out onto the landing of the grand staircase to receive the approving applause of the audience. In 1881 electric lighting was installed. In the 1950s new personnel and freight elevators were installed at the rear of stage, to facilitate the movement of employees in the administration building and the moving of stage scenery. In 1969, the theatre was given new electrical facilities and, during 1978, part of the original Foyer de la Danse was converted into new rehearsal space for the Ballet company by the architect Jean-Loup Roubert. During 1994, restoration work began on the theatre. This consisted of modernising the stage machinery and electrical facilities, while restoring and preserving the opulent décor, as well as strengthening the structure and foundation of the building. This restoration was completed in 2007. The French Post Office has issued two postage stamps on the building: The first was issued in September 1998, for the centenary of the death of Charles Garnier. It was designed by Claude Andréotto grouping elements which recall the artistic activities of the Opera Garnier: the profile of a dancer, a violin and a red curtain. 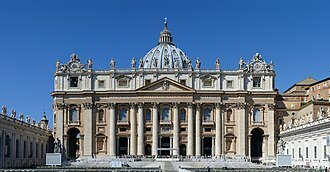 The second, drawn and engraved by Martin Mörck, is issued in June 2006 and represents, in intaglio, the main facade. 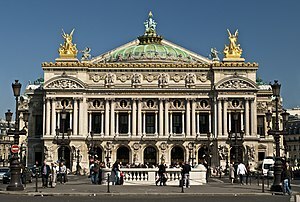 The Palais Garnier inspired many other buildings over the following thirty years. The Opéra-Comique's Salle Favart, which opened in 1898, is an adaptation of Garnier's design on a smaller scale to fit a restricted site. The Hanoi Opera House in Vietnam was built during French Indochina colonial period based upon Palais Garnier. It is considered a representative French colonial architectural monument in Indochina. Several buildings in Poland were based on the design of the Palais Garnier. These include the Juliusz Słowacki Theatre in Kraków, built during 1893, and also the Warsaw Philharmonic edifice in Warsaw, built between 1900 and 1901. The Thomas Jefferson Building of the Library of Congress in Washington, D.C. is modelled after the Palais Garnier, most notably the facade and Great Hall. The Theatro Municipal do Rio de Janeiro (1909) was also modelled after Palais Garnier, particularly the Great Hall and stairs. The Amazon Theatre in Manaus (Brazil) built from 1884 to 1896. The overview is very similar, though the decoration is simpler. The Legends Hotel Chennai in India is inspired by the Palais Garnier, especially the Facade and statues. ^ a b c Ayers 2004, pp. 172–174. ^ Mead 1991, p. 146. Haussmann reported on 14 August 1871 that the site had been cleared and surveyed. A temporary building for the Opéra Agence was erected in August, and excavation was begun on the 27th. ^ Mead 1991, p. 197. According to this source, more work was done after this date, and some parts of the building were never completed. The figure does not include the costs of acquiring and clearing the land, which was the responsibility of Haussmann's Service d'Architecture and probably exceeded 15 million francs (Mead 1991, pp. 140, 146). ^ Nuitter 1875, p. 250. Heights are measured from the ground level of the Place de l'Opéra. The sculpture at the apex of the stage flytower roof is not included, but would add an additional 7.50 metres. ^ Nuitter 1875, pp. 249–250. The length is measured from the south side of the principal facade to the north side of the avant-corps of the administration; the widths, between the exteriors of the two lateral galleries, and the east and west pavilions; basement depth, from the ground level of the Place de l'Opéra to the bottom of the cistern under the stage house. ^ Mead 1991, p. 156. ^ Beauvert 1996, pp. 102–109 (capacity, theatre names); Hanser 2006, pp. 172 (dates of construction). ^ Ayers 2004, p. 188. ^ a b Hanser 2006, pp. 172–179. ^ Simeone 2000, p. 177. ^ Watkin 1996, pp. 391–392. ^ Quoted and translated in Woolf 1988, pp. 220, 233. From Le Corbusier, Almanach d'Architecture Moderne, Collection de 'L'Esprit Nouveau, Charles Eliot Norton Lectures 1938–9 (Paris, 1955), p. 120 ("art de mensonge", "événement Garnier est un décor d'enterrement"). ^ "Bibliothèque-Musée de l'Opéra" (in French) at the BnF website. Retrieved 3 August 2011. ^ "Palais Garnier" Archived 18 October 2011 at the Wayback Machine at the Paris Opera website. Retrieved 3 August 2011. ^ Mead 1991, pp. 4–5; Sveiven, Megan. "AD Classics: Paris Opera / Charles Garnier". ArchDaily. Retrieved 19 March 2015. .
^ Gjertson, Stephen (28 June 2010). "The Paris Opéra: Charles Garnier's Opulent Architectural Masterpiece". Stephen Gjertson Galleries. Charles-Alphonse-Achille Gumery, Harmony, 1869. Gilded galvanoplastic bronze, height: 24' 7 1/4, west facade attic group. ^ Jouffroy's group is titled l'Harmonie in Nuitter 1878, p. 11, and in Garnier 1875–81, vol. 1, p. 424, vol. 2, p. 273, but is identified as La Poésie in the "Table des planches" of the 1875 atlas folio Statues décoratives (View at Wikimedia Commons), and according to Fontaine 2000, p. 82, is also sometimes referred to as Lyric Poetry. ^ Kirkland 2013, pp. 283—284. ^ a b c Fontaine 2004, p. 152. ^ Hanser 2006, p. 177. ^ a b c Fontaine 2004, p. 94–95. ^ Garnier 1871, p. 205; quoted and translated in Fontaine 2004, p. 94. ^ "Guillaume Tison-Malthé, aux fourneaux de L'Opéra Restaurant". cuisine.journaldesfemmes.com. Retrieved 21 November 2015. ^ Mead 1991, p. 53. ^ Kirkland 2014, pp. 188–189. ^ Mead 1991, pp. 53–56. ^ Mead 1991, p. 58; Kirkland. Page 190. ^ Beauvert 1996, p. 102. ^ Kirkland 2013, pp. 185–186. ^ Kirkland 2013, p. 191. ^ Mead 1991, p. 60 ("170 projects"); Kirkland 2013, p. 192 ("171 designs"). ^ Mead 1991, pp. 60–62. Only five projects were awarded prizes, but two were the result of collaborations. ^ Kirkland 2013, p. 192. ^ a b Quoted and translated in Mead 1991, pp. 76, 290. ^ Translated and quoted by Ayers 2004, pp. 172–174. The architectural styles mentioned by the empress were those which prevailed during the reigns of Louis XIV, XV, and XVI. For more information, see the sections on Baroque, Rococo, and Neoclassicism in French architecture. ^ Photo by Louis-Emile Durandelle [fr]. Mead 1991, p. 138, reproduces a different print (fig. 187) of the same photograph (from the Bibliothèque nationale, see a copy at Commons) and identifies the three men. This particular print is from the Metropolitan Museum of Art, whose annotator dates it to ca. 1870. The elevation of the opera house shown in the background is quite similar to a design dated to the spring of 1862 by Mead 1991, p. 90 (see copy at Commons). ^ Mead 1991, p. 137. ^ Mead 1991, pp. 146–147. ^ Mead 1991, p. 147; Hanser 2006, p. 174; Ayers 2004, p. 174. ^ a b Mead 1991, pp. 149–151. ^ Mead 1991, p. 303. ^ Fontaine 2000, pp. 91–92. ^ Mead 1991, p. 185. ^ a b Levin, Alicia. "A documentary overview of musical theaters in Paris, 1830–1900" in Fauser (2009), p. 382. ^ Mead 1991, pp. 142–143, 168–170. ^ Mead 1991, pp. 143–145. 170–172. ^ Mead 1991, pp. 145–146; Folli & Merello 2004, p. 116. ^ Simeone 2000, pp. 177–180. ^ Huebner 2003, p. 303. ^ Sterling, Richard (1 December 2011). DK Eyewitness Travel Guide: Vietnam and Angkor Wat. Penguin. ISBN 9780756687403. ^ "The Juliusz Słowacki Theatre". Karnet. Retrieved 2 January 2019. ^ "Filharmonia Narodowa". Fryderyk Chopin Institute. Retrieved 2 January 2019. ^ Scott & Lee 1993, pp. 142–145. ^ "História". Theatro Municipal do Rio de Janeiro (in Portuguese). Retrieved 2 January 2019. ^ Ramm, Benjamin (16 March 2017). "The beautiful theatre in the heart of the Amazon rainforest". BBC News. Retrieved 2 January 2019. ^ "The Legends Chennai". Retrieved 2 January 2019. Allison, John, editor (2003). Great Opera Houses of the World, supplement to Opera Magazine, London. Beauvert, Thierry (1996). Opera Houses of the World. New York: The Vendome Press. ISBN 978-0-86565-977-3. 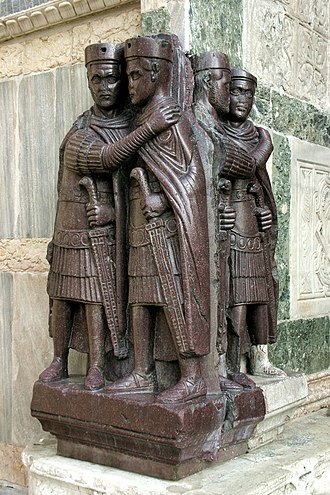 Folli, Andrea; Merello, Gisella (2004). "The Splendour of the Garnier Rooms at the Monte Carlo Casino", pp. 112–137, in Bonillo, Jean-Lucien, et al., Charles Garnier and Gustave Eiffel on the French and Italian Rivieras: The Dream of Reason (in English and French). Marseilles: Editions Imbernon. ISBN 9782951639614. Fontaine, Gérard (2000). Charles Garnier's Opéra: Architecture and Exterior Decor, translated by Ellie Rea and Barbara Shapiro-Comte. Paris: Éditions du Patrimoine. ISBN 978-2-85822-581-1. Fontaine, Gérard (2004). Charles Garnier's Opéra: Architecture and Interior Decor, translated by Charles Penwarden. Paris: Éditions du Patrimoine. ISBN 978-2-85822-801-0. Garnier, Charles (1871). Le Théâtre. Paris: Hachette. View at Google Books. Garnier, Charles (1875–81). Le nouvel Opéra de Paris, two volumes text and six atlas folios (two with architectural plates and four with plates of photographs by Louis-Emile Durandelle of sculptures and paintings). Paris: Ducher. List of entries at WorldCat. Vol. 1, text (1878). 522 pages. View at Google Books. Vol. 1, plates (1880). Partie architecturale, 40 plates. OCLC 487188010, 180042214. Vol. 2, text (1881). 425 pages. View at Google Books. Vol. 2, plates (1880). Partie architecturale, 60 plates. OCLC 487187971, 180042222. [Vol. 3] (1875). Sculpture ornamentale, 45 plates. OCLC 487188045. [Vol. 4] (1875). Statues décoratives, 35 plates. OCLC 487188137. 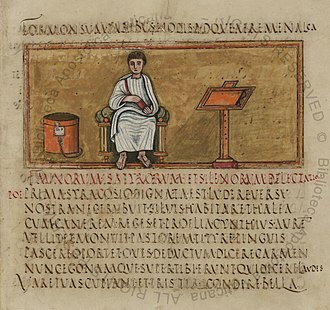 View at Wikimedia Commons. [Vol. 5] (1875). Peintures décoratives, 20 plates. OCLC 487188071. [Vol. 6] (1875). Bronzes, 15 plates. OCLC 487188105. Hanser, David A. (2006). Architecture of France. Westport, Connecticut: Greenwood Press. ISBN 978-0-313-31902-0. Huebner, Steven (2003). "After 1850 at the Paris Opéra: institution and repertory", pp. 291–317 in The Cambridge Companion to Grand Opera, edited by David Charlton. Cambridge: Cambridge University Press. ISBN 978-0-521-64118-0. ISBN 978-0-521-64683-3 (paperback). Guest, Ivor Forbes (1974). Ballet of the Second Empire. London: Wesleyan University Press. ISBN 978-0-273-00496-7. Guest, Ivor Forbes (2006). The Paris Opera Ballet. London: Wesleyan University Press. ISBN 978-1-85273-109-0. Kirkland, Stephane (2013). Paris Reborn: Napoléon III, Baron Haussmann, and the Quest to Build a Modern City. New York: St Martin's Press. ISBN 978-0-312-62689-1. Kleiner, Fred S. (2006). Gardner's Art Through The Ages. Belmont, California: Thomsom Wadsworth. ISBN 978-0-534-63640-1. Mead, Christopher Curtis (1991). Charles Garnier's Paris Opéra: Architectural Empathy and the Renaissance of French Classicism. New York: The Architectural History Foundation. Cambridge, Massachusetts: The MIT Press. ISBN 978-0-262-13275-6. Mead, Christopher Curtis (1996). "Bernier, Stanislas-Louis", vol. 3, pp. 826–827, in The Dictionary of Art, edited by Jane Turner. London: Macmillan. ISBN 9781884446009. Also at Oxford Art Online (subscription required). Nuitter, Charles (1875). Le nouvel Opéra (with 59 engravings). Paris: Hachette. Copies 1, 2, and 3 at Google Books. Scott, Pamela; Lee, Antoinette J. (1993). Buildings of the District of Columbia. New York: Oxford University Press. ISBN 978-0-19-506146-8. Simeone, Nigel (2000). Paris: A Musical Gazetteer. New Haven: Yale University Press. ISBN 978-0-300-08053-7. Sterling, Richard (2011). Vietnam & Angor Wat (DK Eyewitness Travel Guide). London: DK Publishing. ISBN 9780756687403. Watkin, David (1996). A History of Western Architecture, 2nd edition. New York: Barnes & Noble Books. ISBN 978-0-7607-0252-9. Woolf, Penelope (1988). "Symbol of the Second Empire: cultural politics and the Paris Opera House", pp. 214–235, in ''The Iconography of Landscape, edited by Denis Cosgrove and Stephen Daniels. Cambridge: Cambridge University Press. ISBN 9780521389150. Zeitz, Karyl Lynn (1991). Opera: the Guide to Western Europe's Great Houses. Santa Fe, New Mexico: John Muir Publications. ISBN 978-0-945465-81-2. 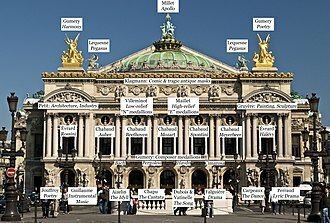 Wikimedia Commons has media related to Palais Garnier. Beaux-Arts architecture expresses the academic neoclassical architectural style taught at the École des Beaux-Arts in Paris. The style of instruction that produced Beaux-Arts architecture continued without interruption until 1968. 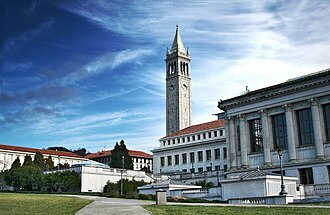 The Beaux-Arts style heavily influenced the architecture of the United States in the period from 1880 to 1920, in contrast, many European architects of the period 1860–1914 outside France gravitated away from Beaux-Arts and towards their own national academic centers. American architects of the Beaux-Arts generation often returned to Greek models, for the first time, repertories of photographs supplemented meticulous scale drawings and on-site renderings of details. Beaux-Arts training emphasized the production of quick conceptual sketches, highly finished perspective presentation drawings, close attention to the program, site considerations tended toward social and urbane contexts. In the façade shown to the right, Diana grasps the cornice she sits on in an action typical of Beaux-Arts integration of sculpture with architecture. A sense of appropriate idiom at the craftsman level supported the teams of the first truly modern architectural offices. The prestige of the École gave the style Beaux-Arts a second wind in combining the new manner with the traditional training and they were followed by an entire generation. Henry Hobson Richardson absorbed Beaux-Arts lessons in massing and spatial planning and his Beaux-Arts training taught him to transcend slavish copying and recreate in the essential fully digested and idiomatic manner of his models. Richardson evolved a personal style freed of historicism that was influential in early Modernism. The White City of the Worlds Columbian Exposition of 1893 in Chicago was a triumph of the movement, the Beaux-Arts curriculum was subsequently begun at Columbia University, the University of Pennsylvania, and elsewhere. From 1916, the Beaux-Arts Institute of Design in New York City schooled architects, bosworth, Carnegie Mellon University, designed by Henry Hornbostel, and the University of Texas, designed by Paul Philippe Cret. Beaux-Arts architecture brought a civic face to the railroad, two of the best American examples of the Beaux-Arts tradition stand within a few blocks of each other, Grand Central Terminal and the New York Public Library. No vestige of the prison remains. The square straddles 3 arrondissements of Paris, namely the 4th, 11th and 12th, the square and its surrounding areas are normally called simply Bastille. The July Column which commemorates the events of the July Revolution stands at the center of the square, other notable features include the Bastille Opera, the Bastille subway station and a section of the Canal Saint Martin. Prior to 1984, the former Bastille railway station stood where the house now stands. The square is home to concerts and similar events, the north-eastern area of Bastille is busy at night with its many cafés, night clubs, and concert halls. As a consequence of its significance, the square is often the site or point of departure of political demonstrations. At that time it housed political prisoners, but religious prisoners, seditious writers. The prisoners were held within the 5-7 story towers, each having a room around 4.6 m across and containing various articles of furniture. The governor of the prison was given an allowance per prisoner. In terms of standards, there were many worse prisons in France, including the dreaded Bicêtre, however, in terms of popular literary accounts, the Bastille was a place of horror and oppression, a symbol of autocratic cruelty. 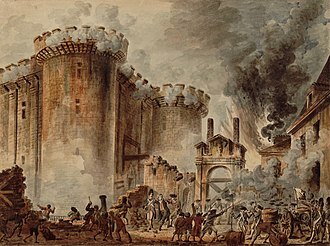 The confrontation between the commoners and the Ancien Régime ultimately led to the people of Paris storming the Bastille on July 14,1789, following several days of disturbances. At this point, the prison was empty, with only seven inmates, four counterfeiters. The regular garrison consisted of about 80 invalides under Governor Bernard-René de Launay and they had however been reinforced by a detachment of 32 grenadiers from one of the Swiss mercenary regiments summoned to Paris by the Monarchy shortly before 14 July. A crowd of around 600 people gathered outside around mid-morning, calling for the surrender of the prison, the removal of the guns, two people chosen to represent those gathered were invited into the fortress and slow negotiations began. In the early afternoon, the broke into the undefended outer courtyard. Daniel François Esprit Auber was a French composer. The son of a Paris print-seller, Auber was born in Caen in Normandy, though his father expected him to continue in the print-selling business, he allowed his son to learn how to play several musical instruments. 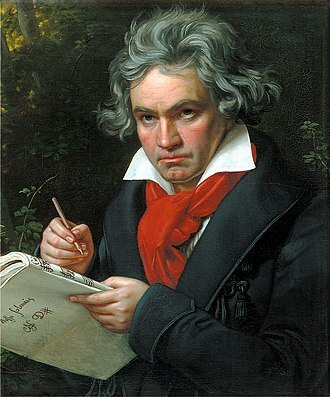 His first teacher was the Tirolean composer, Josef Alois Ladurner, at the age of 20 Auber was sent to London for business training, but he was obliged to leave England in 1804 when the Treaty of Amiens was breached. 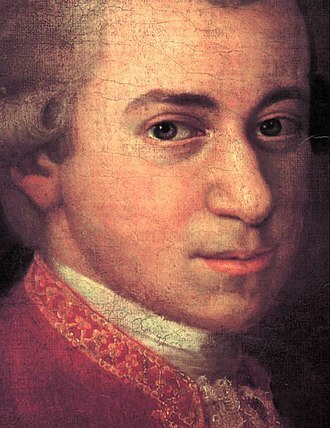 Auber had already attempted musical composition, and at this period produced several concertos pour basse, modelled after the violoncellist Lamare, in whose name they were published. The praise given to his concerto for the violin, which was played at the Paris Conservatoire by Mazas, encouraged him to undertake a resetting of an old comic opera and he began to study with the renowned Luigi Cherubini. In 1813 the unfavourable reception of his one-act debut opera Le Séjour militaire put an end for some years to his attempts as composer, but his failure in business, and the death of his father in 1819, compelled him once more to turn to music. He produced another opera, Le Testament et les billets-doux, which was no better received than the former, but he persevered, and the next year was rewarded by the complete success of La Bergère châtelaine, an opera in three acts. This was the first in a series of brilliant successes. In 1822 began his association with librettist Eugène Scribe. Their first opera, shows evidence of the influence of Gioachino Rossini in its musical style, Auber soon developed his own voice, light, vivacious and melodious—characteristically French. Le maçon was his first major triumph, staying in the repertory until the 20th century, an ensemble from the latter found its way into Herolds ballet La Somnambule as an air parlante. Auber achieved another triumph in La muette de Portici, known as Masaniello after its hero. Produced in Paris in 1828, it became a European favourite, and the foundation work of a new genre, grand opera. La Muette broke ground in its use of a ballerina in a leading role and other dignities testified to the public appreciation of Aubers works. Les Halles de Paris, usually simply Les Halles, was Pariss central fresh food market. The shopping mall welcomes 150,000 visitors daily, since 2010, a major reconstruction of the mall is under progress. The new version is planned to be inaugurated by 2016, the mall remains open during works. In 2013, the Forum des Halles was still the second most visited shopping mall in France with 39.2 million visitors, Les Halles was the traditional central market of Paris. In 1183, King Philippe II Auguste enlarged the marketplace in Paris and built a shelter for the merchants, the church of Saint-Eustache was constructed in the 16th century. The circular Halle aux Blés, designed by Nicolas Le Camus de Mézières, was built between 1763 and 1769 at the west end of Les Halles and its circular central court was covered with a dome, and it was converted into the Bourse de Commerce in 1889. In the 1850s, Victor Baltard designed the glass and iron buildings, Les Halles. Les Halles was known as the Belly of Paris, as it was called by Émile Zola in his novel Le Ventre de Paris, which is set in the busy marketplace of the 19th century. Two of the glass and cast iron market pavilions were dismantled and re-erected elsewhere, one in the Paris suburb of Nogent-sur-Marne, the site was to become the point of convergence of the RER, a network of new express underground lines which was completed in the 1960s. Three lines leading out of the city to the south and west were to be extended and connected in a new underground station. For several years, the site of the markets was an open pit, nicknamed le trou des Halles. Construction was completed in 1977 on Châtelet-Les-Halles, Pariss new urban railway hub, the Forum des Halles, a partially underground multiple story commercial and shopping center, opened at the east end of the site in 1979 and remains there today. A public garden covering four hectares opened in 1986, many of the surrounding streets were pedestrianized. Gare de Châtelet – Les Halles is Pariss most used rail station, the buildings and their surroundings have been criticized for their design. A design competition for the Forum and gardens was held, with entries from Jean Nouvel, Winy Maas, David Mangin, the plan includes extending the pedestrianized area further east to include all the streets bordering the gardens. Charles-Édouard Jeanneret, known as Le Corbusier, was a Swiss-French architect, painter, urban planner and one of the pioneers of what is now called modern architecture. He was born in Switzerland and became a French citizen in 1930 and his career spanned five decades, he constructed buildings in Europe, Japan and North and South America. Le Corbusier prepared the plan for the city of Chandigarh in India. On July 17,2016, seventeen projects by Le Corbusier in seven countries were inscribed in the list of UNESCO World Heritage sites as an Outstanding Contribution to the Modern Movement and it was an industrial town, devoted to the manufacture of watches. His father was an artisan who enameled boxes and watches, while his mother gave piano lessons and his elder brother Albert was an amateur violinist. He attended a kindergarten that used Fröbelian methods, like his contemporaries Frank Lloyd Wright and Mies van der Rohe, Le Corbusier did not have formal academic training as an architect. He was attracted to the arts and at the age of fifteen he entered the municipal art school in La-Chaux-de-Fonds which taught the applied arts connected with watchmaking. Three years he attended the course of decoration, founded by the painter Charles LEplattenier. Le Corbusier wrote that LEplattenier had made him a man of the woods and his father took him frequently into the mountains around the town. He wrote later, we were constantly on mountaintops, we grew accustomed to a vast horizon and his architecture teacher in the Art School was the architect René Chapallaz, who had a large influence on Le Corbusiers earliest house designs. However, he reported that it was the art teacher LEplattenier who made him choose architecture, I had a horror of architecture and architects, he wrote. I was sixteen, I accepted the verdict and I obeyed. Le Corbusier began teaching himself by going to the library to read about architecture and philosophy, by visiting museums, by sketching buildings, located on the forested hillside near Chaux-de-fonds. It was a chalet with a steep roof in the local alpine style. The success of this led to his construction of two similar houses, the Villas Jacquemet and Stotzer, in the same area. The opéra Bastille seen from Place de la Bastille in August 2011. West façade of the opéra Bastille, on the rue de Lyon. Detail view of the Place de la Bastille facade and external staircase. Patrons do not use the stairs, but enter through the street-level doors to the right. House right side of the first balcony, as seen from the back of the arena. Sacre Cœur, seen from the Arc de Triomphe. Construction of the Sacré-Cœur, 10 March 1882. Emperor Napoleon III and Empress Eugénie with their only son. Design of Les Halles in 1863, By Victor Baltard. 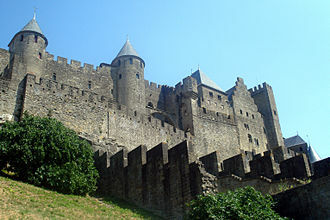 Napoleon III commissioned Eugène Viollet-le-Duc to restore the medieval town of Carcassonne in 1853. Lithographic portrait of Moritz von Jacobi (1801-1874), who invented electrotyping in 1838. Although electrotyping was used for more than a century to make the plates for letterpress printing, it was not used to print his portrait.